Imagine that language learning is a series of stairs that children climb to reach their goal of fluency. How would we want those stairs to look? Of course, we’d prefer that each step is not too difficult to climb, yet not too easy. 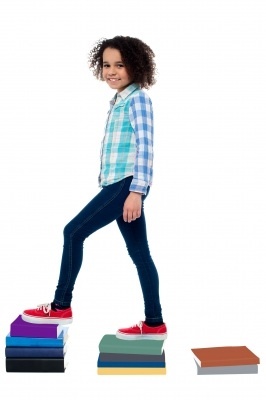 If each step is just the right height, learning can be smooth and fun! Language specialists talk about the process of “scaffolding” language, which means that we give our students the building blocks they need to climb the language stairway easily. For our young learners, here are three strategies that we use in Magic Time to ensure that language learning is successful. Students then “climb” up the next step of the stairway by placing the picture cards of the words they have learned above the blank line. Students then learn to say, “It’s a penguin,” “It’s a giraffe,” and so on. Finally, students practice fluency of this question and answer through songs, movement, games, and much more. As students are introduced to the above words and phrases, there is a “receptive” phase when they simply need to hear the language. It is not necessary for students to repeat the words or phrases until they feel ready. Eventually, through the chants, songs, and activities in the Magic Time pages, students move smoothly from “receptive” to “productive” language, when they are actually speaking the words meaningfully. In the first stages of producing language, it is best to invite the students to speak together as a group. Magic Time does this by introducing chants and songs which produce the language in a fun way. Students chant and sing together as they move to the language. This encourages all students to participate, from confident students to shy students. Later, when activities are introduced using the target language, students begin to practice the language individually. Since they have had group practice, they are happy and able to do so. Here is a good example of an activity from Magic Time 2 that builds individual language practice in a meaningful way. It is a craft activity that encourages creativity. It is then used to practice the language with a partner, which builds strong communication skills. Download this free Animal Picture Viewer taken from our Magic Time 2 Teacher’s Book. Student A (with a picture of a kangaroo in the viewer): What is it? Student B (pointing): It’s a kangaroo. Students can take turns asking and answering questions. This activity can be continued at home, with the student and parents interacting. Scaffolding is an effective approach to language learning. As students climb the stairs of learning, they are able to use more words and phrases, combining them and creating new opportunities for communication. We hope you enjoy this activity with your students. Be sure to let us know about your successes!